What is qualitative soil food web analysis? Qualitative Analysis (QA) determines the active microbial life in various media such as soil, Compost, Compost extract and Compost teas. However, QA can be done on just about anything with living microorganisms in it such as kraut, pond water, lagoon waste and so on. Identifying the presence of “fertilizer bags,” like bacteria and fungi indicate the nutrient retention capabilities of a soil or soil product. Likewise, identifying “fertilizer bag openers and spreaders” such as protozoa, nematodes and microarthropods indicates if nutrient cycling is able to take place in a soil or soil product. Te predator-prey relationship between these organisms is the soil food web in action. While nutrient cycling and retention constitute as two benefits, the dynamic and ever changing interaction of these organisms also assist in plant productivity, disease resistance, water retention, carbon sequestration and toxin breakdown in soil systems. The foundation of this work lies in the scientific findings that diversity allows for resilience and flexibility in a multitude of environmental changes. The QA represents the active microorganism presence in the sample. Tis means that you will have an idea of what nutrients are being retained and cycled based on the organism presence in the sample. In a QA you will receive information targeting the functional groups of the soil food web. Species will not be offered, as the type of microscopy used does not allow for identifcation of species. • Indication of what the product is best suited to grow in plant succession. Is it weeds, vegetables, fruit trees or old growth conifers that will thrive in your soil or soil product? The QA with Haviland Earth Regeneration will also include photos and videos of the organisms that are in the sample as well as a 15 minute phone consult summary about the analysis. Depending on your current knowledge of the soil food web, a number of things can be discussed regarding the sample(s). If you don’t know what the organisms do or are, that will be discussed. If you want action steps on how to improve your soil or soil product, that will be offered. Molly will keep the time and inform you when the 15 minutes is reached. After 15 minutes consultation fees begin at $25/15 min. * The consult is not 15 minutes per sample, it is a summary of the collective samples. 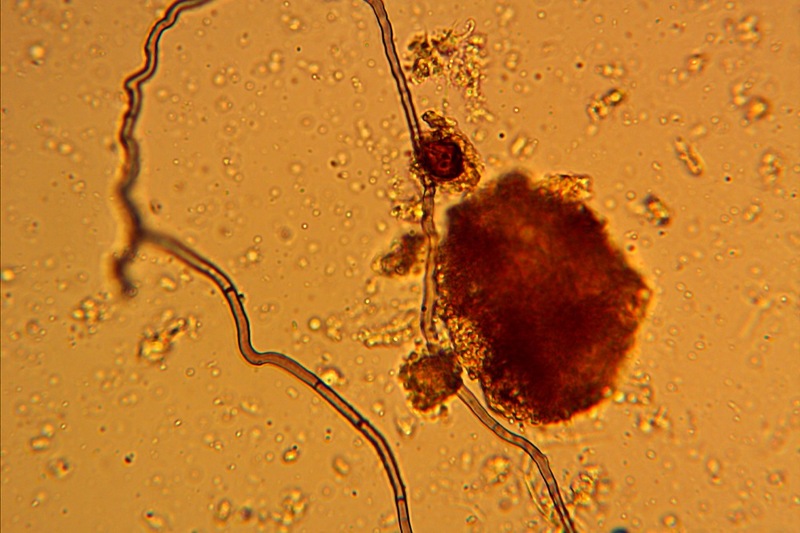 This is a beneficial fungal hyphae (strand). While bacteria are the brick makers in soil structure – sticking sand, silts and clays together, it is fungi that are the mortar, they hold the bricks of soil together. The large brown blob to the right is a soil micro-aggregate, the foundation of soil structure. The dark brown color is a result of soil organisms breaking down organic matter over and over again. This continuous breakdown creates a highly complex acid called humic acid. Humic acid is one of the elements needed for soil humus formation. 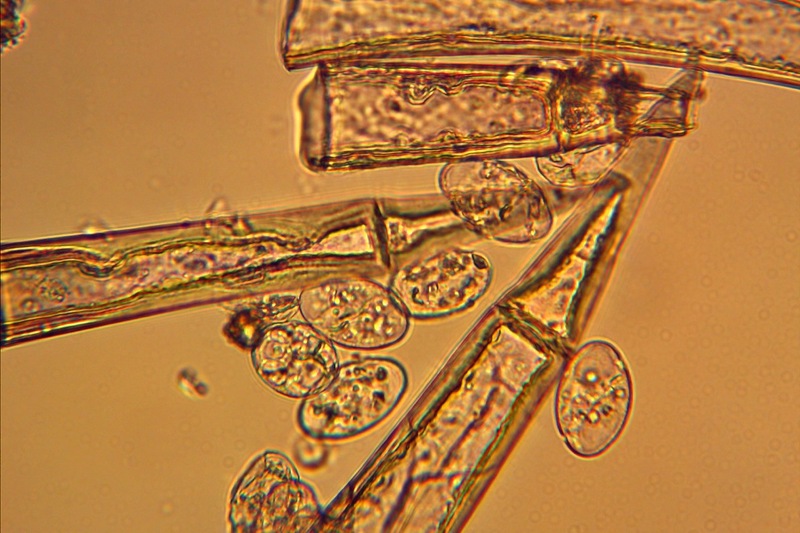 It is sequestered carbon and thus, is food for soil organisms such as fungi.